A rainbow of color, whirling wooden movement, a tinkling bell. 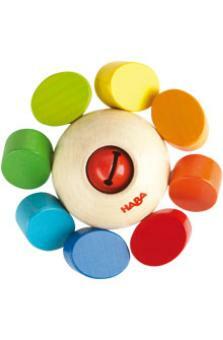 Haba has us captivated AGAIN! 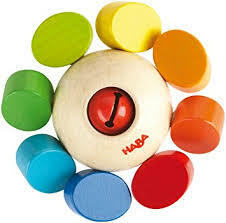 Babies find this colorful clutch toy to be entertaining, mesmerizing fun! No matter how they flip it, pieces move, color invites, and cheery jiggling results! Clutching Color Whirligig is made of natural beechwood with safe water based color. Safe for teething, built to last.